Home » News » Equipos exhibits Medica’s EasyRA® Clinical Chemistry and EasyLyte® analyzers at the National Congress of Clinical Chemists in Mexico. 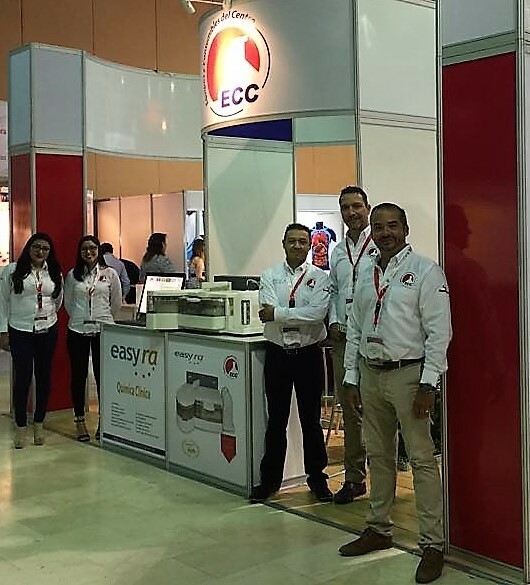 Equipos exhibits Medica’s EasyRA® Clinical Chemistry and EasyLyte® analyzers at the National Congress of Clinical Chemists in Mexico. Equipos y Consumibles del Centro S.A., Medica’s partner in Mexico attended the 2018 XLII National Congress of Clinical Chemists CONAQUIC and EXPOQUÍM-Tabasco. Here, the Equipos team prominently displayed Medica’s EasyRA Clinical Chemistry Analyzer which provides a compact, benchtop, easy-to-use and easy to maintain solution for small to medium sized clinical laboratories. Javier Carmona (right), General Director, and the Equipos Sales and Marketing team prepare to demonstrate why the EasyRA Clinical Chemistry analyzer is the best-in-class solution for clinical chemists working in low to medium sample volume laboratories. 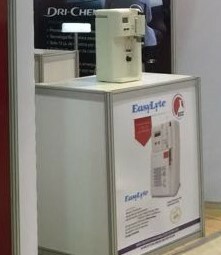 Equipos also displayed the EasyLyte analyzer at their booth. Medica’s EasyLyte family of electrolyte analyzers are globally recognized as the gold standard in ISE technology and have served the Latin and Central American electrolyte market for over 30 years. Medica Corporation would like to thank the team at Equipos y Consumibles del Centro S.A. for their continued support and enhanced business partnership.